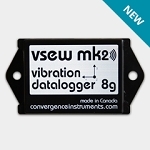 The Vibration Meter Data Logger – Vibration Sentry E-16g is a new generation of smart data logger that can record acceleration, inclination, vibration and impacts. It includes a 3-axis +-16g MEMS accelerometer, an accurate date/time clock and a non-volatile 128 Mb recording memory. Depending on the settings it can record vibration signals and/or RMS levels for months. Its very small size allows it to be attached to or embedded within the monitored equipment. 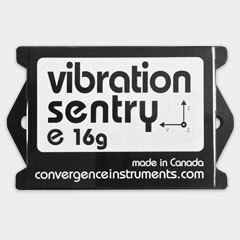 The Vibration Meter Data Logger – Vibration Sentry E-16g is an all digital design with an integrated oscilloscope function that can show the vibration signals in real time, and an integrated spectral analyzer function that shows a 512-line spectrum in real time. It is self-calibrated using the earth’s gravity as a reference. An auto-rec feature allows the instrument to stay dormant for months, only recording when the acceleration signals are detected over an adjustable threshold. Management of Time Zones at the instrument level. Settings are retained through a reset. The Vibration Sentry E series of vibration meter data logger is ideal to monitor shipments in transit and record adverse events such as shocks, high vibration levels and/or tilt. In order to do that properly, careful attention must be paid to the instrument’s configuration and installation. Monitoring of operation and transport conditions of fragile equipment (VS_E-200g recommended). Long-term measurement and recording of accelerations, impacts, vibration signals and RMS vibration levels. The VS_E-200g is generally better suited to shock and other high-g measurement applications. Long-Term Seismic Monitoring and Long term inclination monitoring (VS_E-16g recommended).